New York Review Books, 9781681373027, 336pp. An invaluable guide to lives and work of Frank Gehry, Atoni Gaudí, Frank Lloyd Wright, Louis Kahn, Maya Lin, and other important figures of 20th and 21st century architecture. 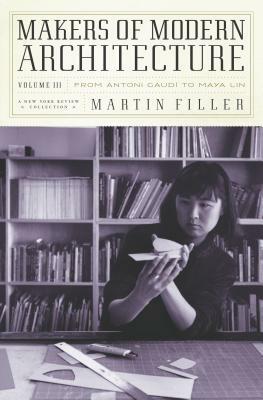 Martin Filler's "contribution to both architecture criticism and general readers' understanding is invaluable," according to Publishers Weekly. This latest installment in his acclaimed Makers of Modern Architecture series again demonstrates his unparalleled skill in explaining the revolutionary changes that have reshaped the built environment over the past century and a half. These studies of more than two dozen master builders--women and men, celebrated and obscure, idealists and opportunists--range from the environmental pioneer Frederick Law Olmsted and the mystical eccentric Antoni Gaudí to the present-day visionaries Frank Gehry and Maya Lin. Filler's broad knowledge embraces everything from the glittering Viennese luxury of Josef Hoffmann to the heavy-duty construction of the New Brutalists, from the low-cost postwar suburbs of the Levitt Brothers to today's super-tall condo towers on Manhattan's Billionaire's Row. Sometimes the interplay of social and political forces leads to dark results, as with Hitler's favorite architect, Albert Speer, and interior designer, Gerdy Troost. More often, though, heroic figures including Frank Lloyd Wright, Louis Kahn, and Lina Bo Bardi offer uplifting inspiration for the future of the one art form we all live with—and in—every day. Martin Filler was born in 1948 and received degrees in Art History from Columbia. Nearly 1,100 of his writings have been published in more than thirty-five journals, magazines, and newspapers in the US, Europe, and Japan during his five-decade career. Since 1985 his essays on modern architecture have appeared regularly in The New York Review of Books. His first collection of those pieces, Makers of Modern Architecture (2007), was issued in Spanish as La arquitectura moderna y sus creadores (2012), followed by Makers of Modern Architecture, Volume II (2013). Filler was elected a fellow of the American Academy of Arts and Sciences in 2003. He and his wife, the architectural historian Rosemarie Haag Bletter, were guest curators of the Whitney Museum of American Art exhibition “High Styles: Twentieth Century American Design” (1985) and wrote the documentary films Beyond Utopia (1983), Arata Isozaki (1985), and Stirling (1987). They live in New York City and Southampton.